In today's bustling world of smartphone apps, Google has kept an eye on the guy who may not have hundreds to drop on a phone. Google continuously revamps its mobile browser edition so basic handhelds get the same thorough search experience you'd find on a smartphone. 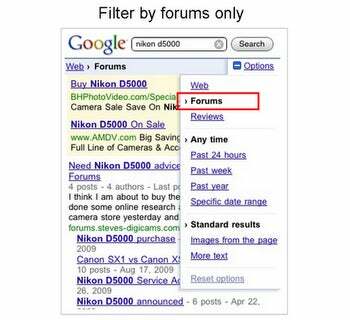 The latest evolution in mobile search is a filtering option that allows for specified search results. This feature almost seems like it was created specifically for picky tech shoppers. Search for a device, click the "options" drop-down located beneath the search bar, and filter your results. You can scope out forums to get the word-of-mouth nitty gritty, or reviews from trusted sources. Further delve into your results by choosing a timeframe -- any time; past 24 hours; past week; etc. Google's advancement takes the desktop experience into the palm of your hand, even if you have a basic cell phone. And in a world where some people have decided they'd rather fiddle with a phone than in the bedroom, well, props go to Google for making that possible.